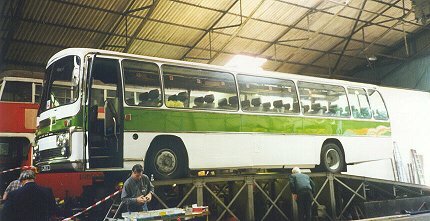 In 1973 London Country's idea of a Green Line coach was a Leyland National in dual-purpose NBC green and white livery, with plastic seats. These replaced the Routemaster coaches, with their conductors and deeply-cushioned seats, and did the image of Green Line no good at all. At the same time London Country realised that the Nationals could not be hired out in the luxury coach hire market. So they dipped their toes into the waters of proper coaches and bought five AEC Reliances with Plaxton coach bodies (with coach doorways and coach seating). To mark their differentness they were un-numbered at first, being recorded only in terms of their registrations (SPK 201-5M). Livery was National white overall, with red/blue National markings and N-symbols. They received numbers 1-5 in 1976, and in 1977 became P1-5. 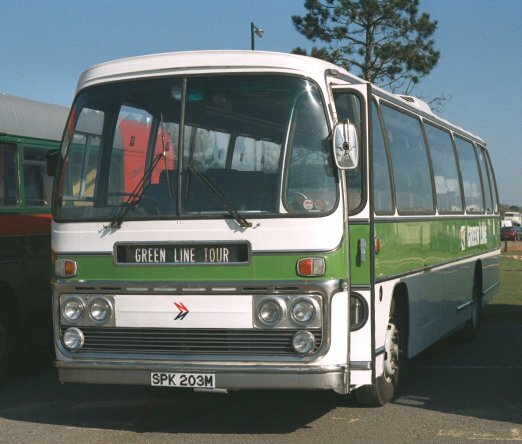 Livery changed in 1977 as more luxury coaches were acquired for the GreenLine services as well as tour and hire duties, and the coaches received a broad green waist-band of green, with Greenline fleetnames and a National emblem on the boot. The fabulous five became just part of the pool of luxury coaches, and London Country's increased involvement with National Express took them far and wide on Express and Holidays business. All five lasted through the break-up of London Country in September 1986, P1 and P2 going to LCSW, P3 and P5 to LCNE and P4 to LCSE. London Country North East withdrew its pair in May 1988, after a spell as trainers, and they were sold for further service with other operators. South-West also found them useful as trainers: P2 was sold in March 1990, but P1 continued with London & Country. Kentish Bus renumbered P4 as 221 in its dual-purpose coaches fleet, and sold it in February 1989. They had given good service, all lasting upwards of fifteen years in service. 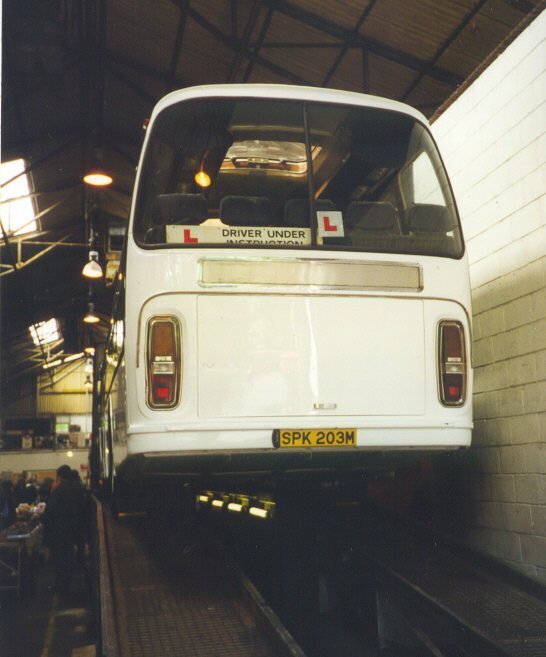 London Bus Preservation Trust at Cobham acquired P3 as a driver trainer, none of its other vehicles meeting the new length requirements, then adopted it as part of the collection. It has been restored to 1977 Greenline livery. In February 1976 London Country acquired two more Reliances, with very similar Plaxton bodies, but with the offside emergency door behind the driver rather than at the rear. They also had the older pattern of rear lights, with reflective saucers. Superb! BLA 593/4H were rather older, new in 1970, and secondhand from National Travel South-East. They were needed to help with increased tour work. They were numbered into the P-class in June 1977, becoming P6 and P7, and received the green-band on white livery. May 1978 saw the arrival of another five from National Travel South-East. These were needed to cover the excursions work taken over from Maidstone & District in Gravesend. They were going to be the PX class (PX11 was so lettered) but became P8-12. Being already rather older than P1-5 they did not last nearly so long, and departed in 1981 or 1983. Spring 1979 saw another five Reliances arrive, but this time with Duple bodies. Initially they were numbered D1-5, but almost immediately they were renumbered to run on consecutively from the P-class, as D13-17. These came from National Travel (London). 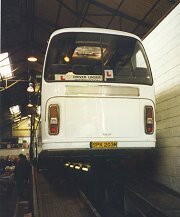 Some were fitted with luggage racks, some not, giving them capacities of C44F or C51F. They were acquired to help with London Country's increased involvement with National Express work, which took them far from the London Area. Five more older Plaxtons (1972 this time) were acquired from National Travel (East) in Sheffield, and arrived in spring 1980 for a three-year sojourn with London Country before they returned to Sheffield in July 1983.